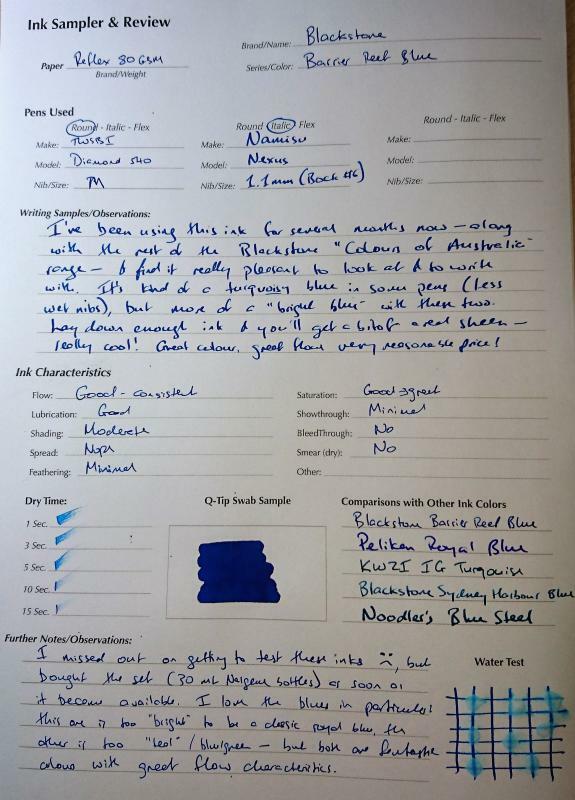 I've been meaning to post a review of some of the Blackstone "Colours of Australia" inks for some time now - but didn't realise till I checked that these inks have been in my possession for a little over 6 months. That makes sense, actually - I ordered them just before moving house, which coincided with a whole lot more stuff to get done, both on the home front and at work! No matter: I've had 6 months to get to know these inks, and try them out in a variety of pens - and to come to really appreciate (some of) them. Full disclosure: Kevin from JustWrite.com.au has sent me ink samples and pens in the past, free in return for testing and/or review - but this range of inks I purchased with my own funds. I can't decide which of the Blackstone inks I like best, but it's a toss-up between the blues. Sydney Harbour Blue (review to come) is a darker tealy-blue which looks more 'serious', while Barrier Reef Blue is a vivid, bright blue colour that really does (maybe?) remind me of a tropical reef. Both inks flow well in my pens, shade well, and produce a certain amount of sheen - but more on that later. Here's a photograph of the review page I filled out - it captures the hue a little better (I think) than the scan which follows. 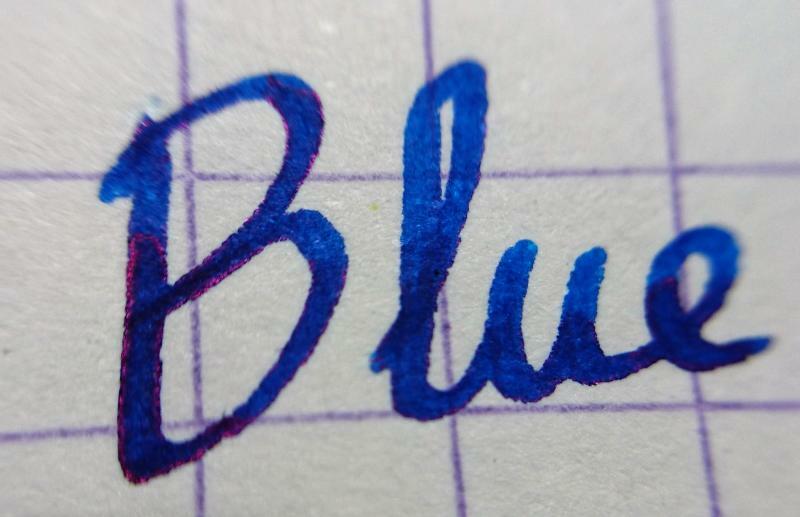 I really like the brightness of this colour - it shades (and sheens) when using a wider nib, and produces a brighter blue colour with finer nibs. 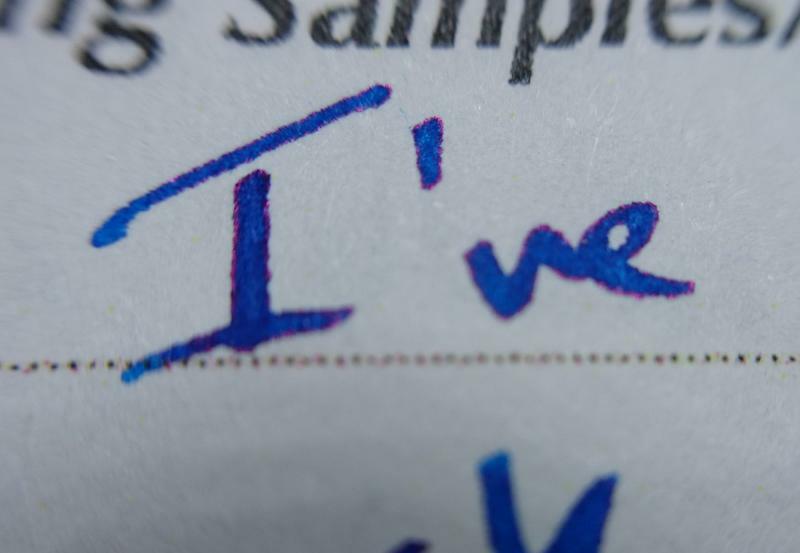 And here's the slight sheen that's possible writing on regular (Reflex) copier paper! Thank you - I'll take that as a compliment, though I suspect the praise is more for the ink than for my handwriting (!). The added bonus for me is that this is an Australian-made ink, so shipping costs don't add significantly to the cost - a really nice ink at a very reasonable price! Thanks for the review. 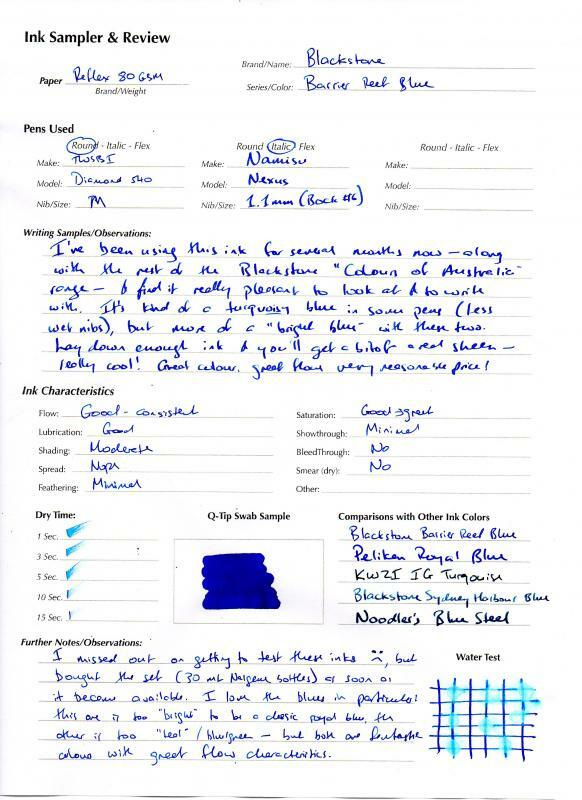 I too have been using Colours of Australia inks for several months. I do like Black Stump. Daintree Green is one of the wettest inks I've got, & I've got a few! It needed a fine, dry nib to tame it. The colour is great though. My Uluru Red has gone a bit gunky, sadly. It is very good to find some new ink makers/suppliers here in Aus. Makes a change from having to buy from overseas. It's just a shame that we've had delays with our recent orders from JustWrite & have twice received the wrong quantities. THIS IS A FANTASTIC INK!!!.. One of my favorites and it had been i my pen since I acquire it almost a year ago... (I was testing it).. I have NEVER ran into problems with it. After almost a year.. (with regular use).. still starts up perfectly well. I haven't clean my pen since I keep refilling with BRB... so there you go. Thanks for your comments! The reason I'm hesitant to review all the inks is that my Uluru Red was also gunky - as was the replacement bottle sent to me. I believe the ink has now been reformulated to address this problem - but I also don't find it the most appealing of reds. I like the Daintree Green - though I haven't found it overly gushy. Sorry to hear about your ordering issues - the last I heard from Kevin ("Mr JustWrite"), he'd recently lost a key employee, and given the small size of his operation that was causing him some big headaches. Hopefully it'll all be back on track soon! The reason I'm hesitant to review all the inks is that my Uluru Red was also gunky - as was the replacement bottle sent to me. I believe the ink has now been reformulated to address this problem - but I also don't find it the most appealing of reds. I need to check my Uluru.. I haven;t use it since I did a quick review on it, I like my reds darker and I keep using Red Cashmere since almost 2-3 years ago.. I'll report back if I find it gunky. Thanks for the review. This looks like a really pretty color. I caught this fairly early on (the 'benefits' of being an early adopter), and Kevin got straight onto it - so it may or may not be a problem for you. My impression was that the problem was caused by one of the 'ingredients', that didn't affect every bottle equally - it wasn't a fungal growth or anything.